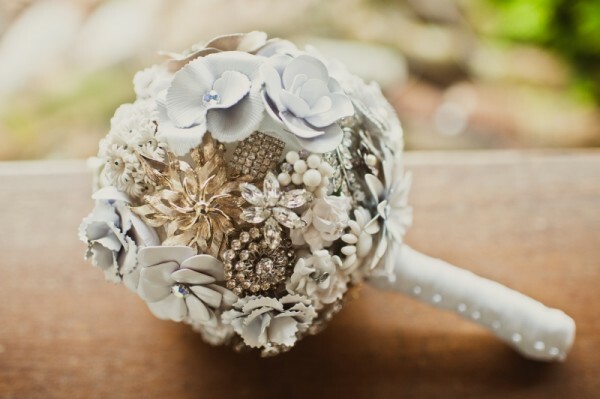 Brooch bouquets are perhaps one of the fastest growing wedding trends in the bridal market. Gone are the days of getting rid of your wedding flowers after the big day, or shelling out hundreds of dollars to get your fresh florals preserved in a box. Your bouquet is now something that you can keep on display after the big day, and pass down to your children when the time comes. Not only are there endless styles and details to nail down when it comes to designing your bouquet (no two are the same)- there are several ways to go about collecting the pieces that will make up your bouquet. While we offer a full-service option (where we supply all of the brooches), we’ve also created several bouquets using the bride’s pieces. Brides collect pieces in a variety of different ways. Some inherited a collection from family. 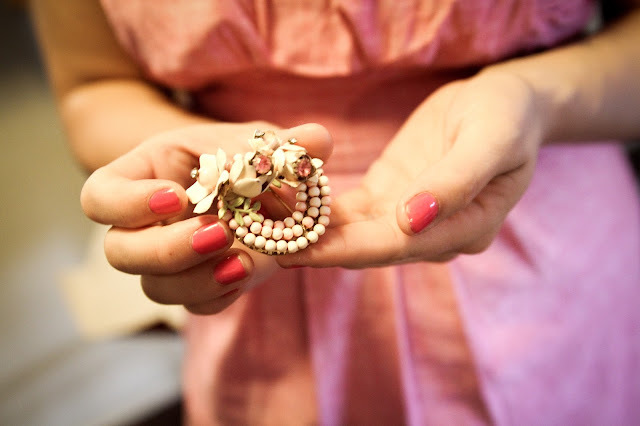 Some girls are shoppers and hit up stores like Charming Charlie for new sparkly brooches, or thrift stores to add some vintage charm. Something old, something new? Check! A cost-effective and sentimental way to go about starting your collection is throwing a “brooch shower” instead of the typical bridal shower. 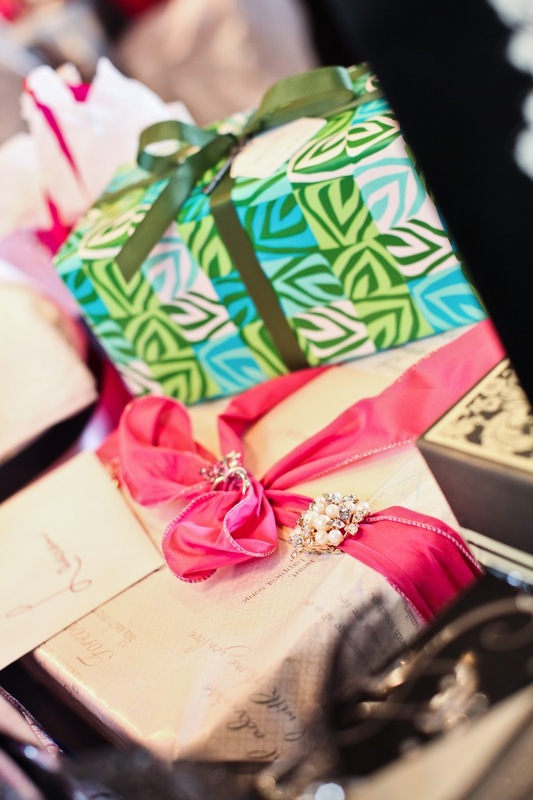 Add a note with your registry information asking shower guests to bring a brooch or pieces of jewelry in addition to (or instead of) a shower gift. 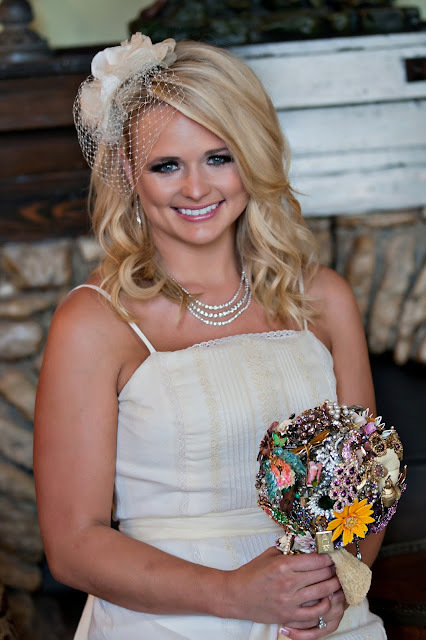 When I created Miranda Lambert’s brooch bouquet in May of 2011, I used the 71 pieces that she recieved from friends and family. Miranda’s mom and closest girlfriends surprised her by asking her shower guests to each bring a brooch for her bouquet. I then wove all of her friends’ and family pieces into a gorgeous bouquet that told her one-of-a-kind story. After the wedding, Miranda’s mom called to let me know what a hit the bouquet was. All of her wedding guests were not only lusting over her sparkly brooch bouquet, they were lining up to take a closer look and find their special piece. 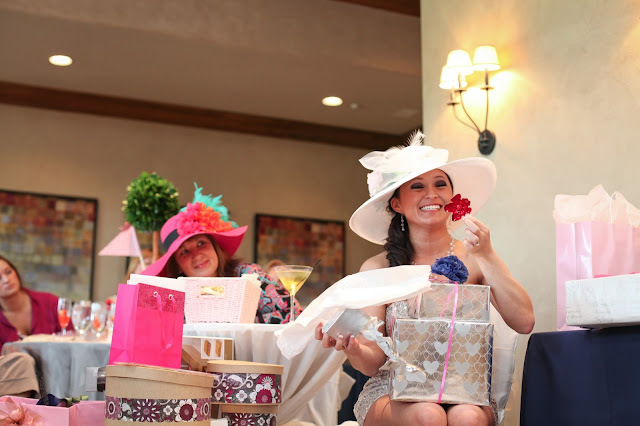 Of course Miranda was the main attraction that day, and her handsome new hubby Blake Shelton was a close second... it was exciting to know the bouquet still caught a little spotlight. One of Miranda's bridal shower guests brought this brooch, by Karen Lindner Designs. This stem was placed on the top of the stem of her bouquet. Photo by Robert Evans. There are no rules here- it totally depends on what you want! You can ask the guests to bring brooches that are old or new. Ask for them all to be one color, a specific color palette, or let your guests go wild. 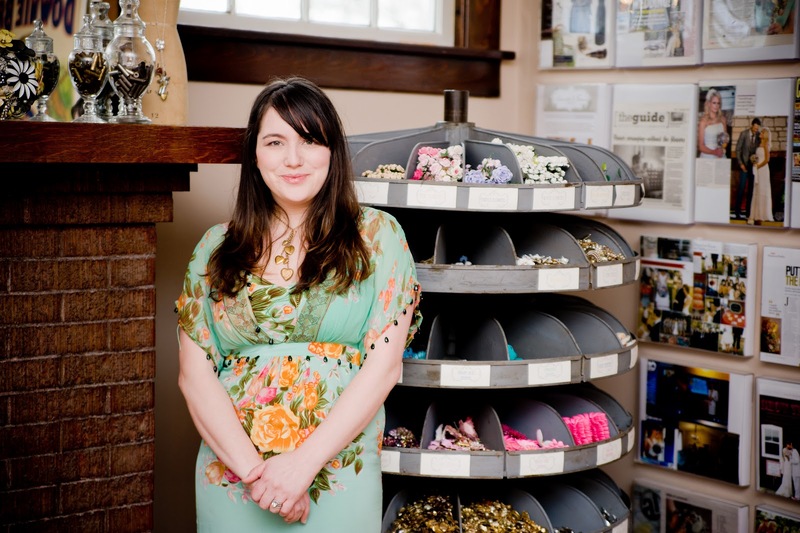 You can get as specific as you’d like, as there are thousands of brooch styles out there. I have used thousands and thousands of vintage brooches and I rarely have seen two of the same piece. 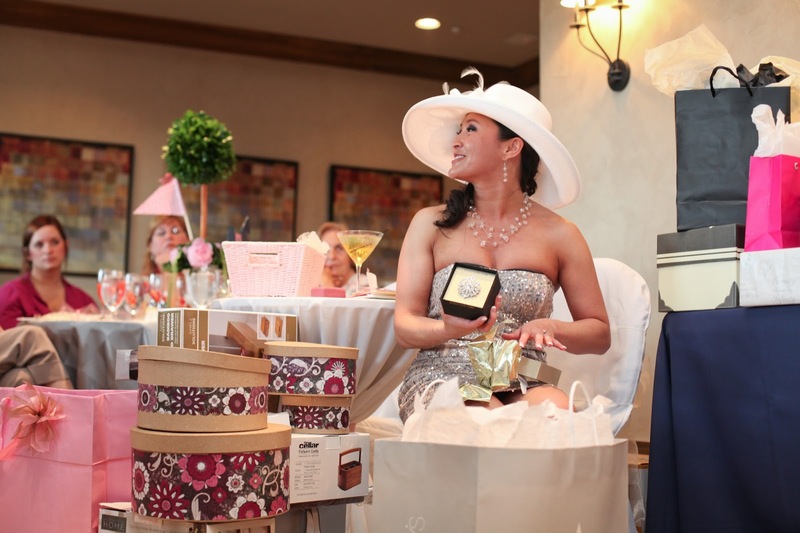 Just include a note with your shower invitation, or on your wedding website, asking that guests bring a brooch in addition to (or in lieu of) a gift. *Be specific when it comes to color and style. This is your bouquet. 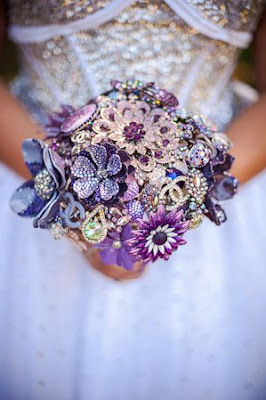 Remember that you’re giving your guests some leeway to determine how your bouquet will look, so ask for what you want. *You will have guests excited to hit flea markets and thrift stores and others looking for a simpler route. Stores like Charming Charlie are a perfect place to send them. Or send them to Etsy for vintage. You can even 'favorite' ones on Etsy and send the listings to friends, making it easy to keep your bouquet the way you picture it. Stores like ours, The Ritzy Rose, and our other store, Vintage Diehls are examples that have hundreds to browse through. We recently discovered another Etsy shop that we just love called Alicia's Oddities, where they hand-craft enamel flowers for brooch bouquets. *Inspire your guests by sending photos of finished bouquets that you love. 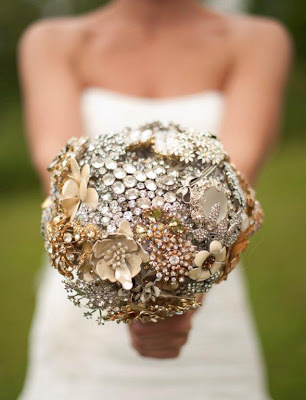 Some friends may have a hard time looking for brooches if they’ve never seen a finished brooch bouquet. By giving them a visual of the end result, they will have an easier time choosing a great piece to go into your bouquet. Pinterest is a great resource- you can pin all of your inspiration bouquets in one spot and send the link to your friends. Start here on Pinterest or Etsy. *Start well in advance. If you know you want to do this, make a plan early and let your guests know so they have time to shop! They may want to make a few special shopping trips, or search for the perfect piece online, which requires extra time for shipping. *Challenge your guests to creatively include the brooch in the packaging. You can have a special prize at the shower for the guest who uses a brooch in the most beautiful or creative way. Be sure to have someone snap some photos of the lovely packaging! Brooches used creatively on the shower packages. If you don’t have your own personal collection, or you don’t want to go the brooch shower route, do not fear. 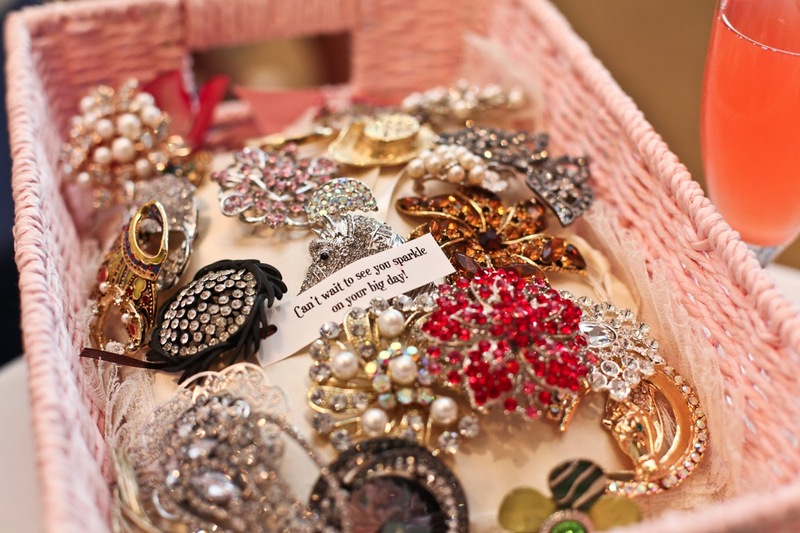 Here at The Ritzy Rose studio, we have almost thousands of vintage brooches in the collection. The pieces are picked out one at a time from estate sales, auctions, antique sales and personal collections. Or, if you want to collect a few then let us finish the job, that’s what we’re here for! We can discuss adjusted pricing for this. As The Ritzy Rose has grown we have realized that a story goes a long way. We loved all of the personal touches at our wedding with stories behind them. When the brooch showers started we realized how amazing it was. The bouquet becomes a story with family pieces reminding you of loved ones not there, to a reminder of friends and family closest to you. When you look at the bouquet in years to come you will recognize their pieces and it brings back wonderful thoughts and memories. We may be sentimental fools here at The Ritzy Rose, but I love seeing the stories within my own bouquet. We want the same for you!